The six members of the U.S. team that won this year’s International Math Olympiad (IMO) last week were all boys. And that’s no fluke. Since the U.S. began participating in the competition in 1974, 88 percent of its teams have been entirely male. 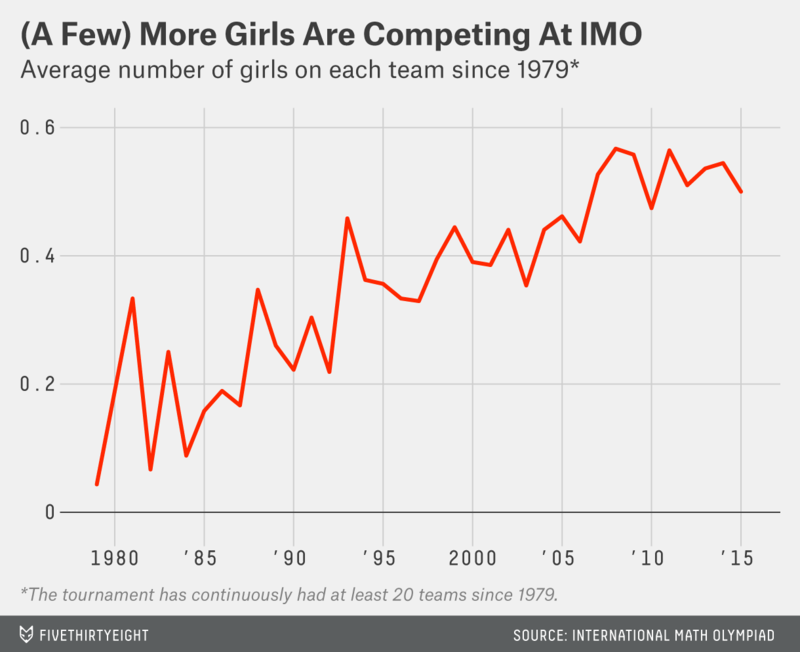 In recent years, girls have been a larger share of all IMO teams; the average number of girls per team has risen from 0.2 in the 1970s to 0.5 in the 2010s (so far). Of course, the U.S.’s gender gap at the upper echelons of math research isn’t quite as stark as its IMO record. 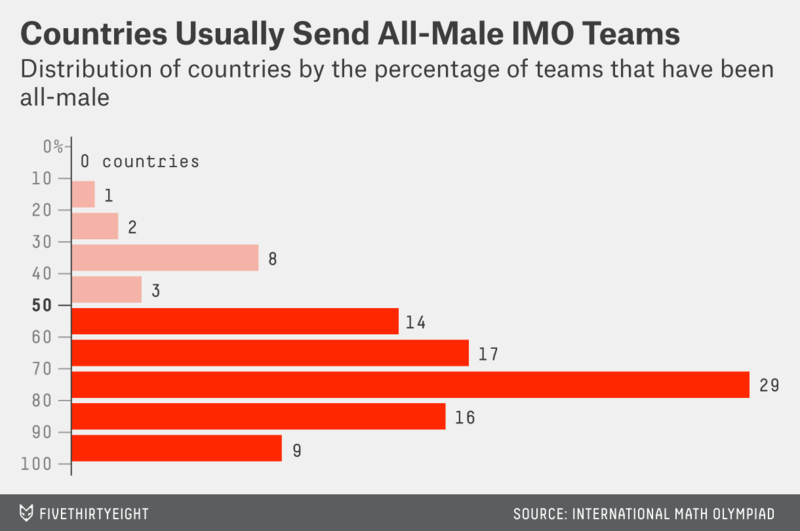 But the gender makeup of the U.S.’s IMO teams does reflect a broader gap in mathematics. During the 2012-13 academic year, the most recent year covered by the American Mathematical Society’s annual reports, just 27 percent of all math Ph.D.s awarded to U.S. citizens went to women. At the IMO, even the teams who bring the most female competitors don’t bring very many. The six nations at the top of the list — Bolivia, Albania, Slovenia, Bosnia and Herzegovina, Macedonia and Croatia — have averaged between 1 and 1.3 girls per IMO team.3 All those countries joined the IMO more recently (1993 for all nations except Bolivia, which began competing in 1997). But since 1993, the U.S. average has been only 0.2 per team. Only countries that sent teams to 10 or more IMO events were included in this analysis; low-attendance teams had very noisy data. The number of girls on a team doesn’t have much to do with a nation’s performance. The average number of girls per team accounts for only 3 percent of the variation in the average number of gold medals a nation wins per competition. Restricted to nations that have attended the IMO 10 times or more.